Bob Soderlund, right, is pictured with his longtime friend, the late George Watts. Soderlund was remembered at Maht Mahs on Nov. 23 two months after he passed in the Philippines. As thousands of photographs from the Ha-Shilth-Sa archives are gradually released to the public, it’s evident how the lens of Bob Soderlund could catch glimpses of authentic humanity. Personality peaks through the wrinkled face of an elder, while the pride from generations of ancestors fortifies another person who stands to speak at a forum, or sunlight catches rising dust during a baseball game from the 1970s. Picked from the river of time, these images from the first decades of Canada’s oldest First Nations newspaper document the legacy of a man who served the Ha-Shilth-Sa for 24 years, including most of this time as the Nuu-chah-nulth publication’s editor. But a celebration of Soderlund’s life at Maht Mahs on Nov. 23 reminded those in attendance that his impact spread far beyond his work at the newspaper. The son of John and Hildur Soderlund, Bob first came into contact with Cote’s family when he met George Watts at school when he was 12. A lifelong friendship flourished between the two, leading to Soderlund’s adoption by George’s parents Hughie and Grace Watts after bob lost his father as a young man. George Watts would become one of the founders of the West Coast District Council of Indian Chiefs, while Soderlund lent his talents to the Ha-Shilth-Sa when the first issue came out in early 1974. Eamer recalls how Soderlund studied commerce in university, but dropped out one semester away from earning a bachelor’s degree. He saw this as a courageous move when Soderlund abandoned this professional path, returning to Port Alberni to work in the Alberni Plywood mill. “He knew that he did not want to live that kind of lifestyle,” said Eamer. Soderlund remained dedicated to the Ha-Shilth-Sa through the 1970s, at times working for free when funding for the newspaper fell short. She remembers seeing Soderlund write stories with his two-finger typing style. Soderlund would remain a fixture in Nuu-chah-nulth communities for years, including after he retired from the Ha-Shilth-Sa in 1998. 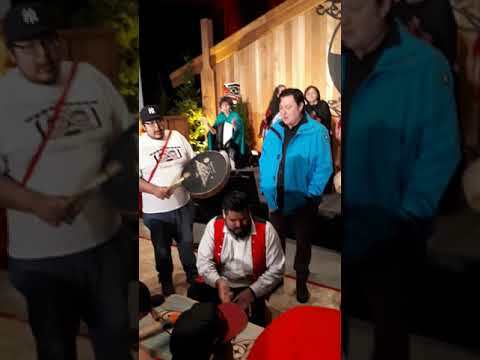 He received what many consider the ultimate honour from a First Nation when Tseshaht Ha’wilth Adam Shewish named Soderlund Hayupinu>, after a chief from long ago. Hesquiaht elders also gave Soderlund a traditional name. In a farewell column Soderlund mentioned a t-shirt business that he was to continue until his final years, making apparel that often displayed Nuu-chah-nulth designs. In the 1970s Soderlund travelled through Eastern Europe, the Middle East and India, and he would continue these international adventures in his later years. His travels eventually found Nerlita Asombrado, who he married in the Phillipines in 2005. Soderlund died with Nerlita by his side on Sept. 21 at the age of 73 in Angeles City, in the Philippines province of Pampanga. Despite fundraising efforts to allow Nerlita to travel to Vancouver Island for the celebration, Soderlund’s extended family ran into roadblocks with federal departments. But Nerlita was able to see the celebration through a live video feed. Charlotte Cote speaks about her late uncle, Bob Soderlund. Soderlund's lifelong friend Barry Coulson performs a song he wrote for Soderlund.